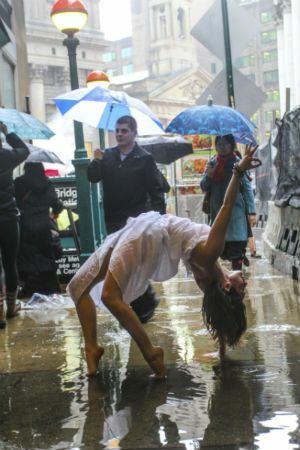 Not long ago, a photograph appeared on my Facebook feed that stopped me in my tracks—a woman dressed in white, practicing urdhva dhanurasana (wheel pose) on a city sidewalk as rain cascaded across her opening heart. I felt as though I could hear the silence of one passerby as she watched her melt into the posture. I felt pulled into the rain. With umbrella in hand, I stood among fellow pedestrians on-the-go, captivated by her timelessness. And for a moment I was also her. I was leaning into surrender as the background faded. 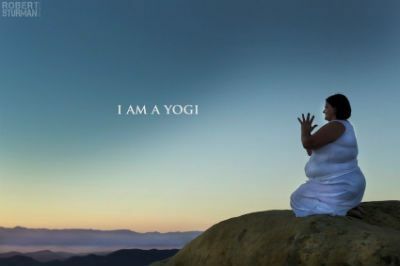 That photo was the work of Robert Sturman, an artist with a gift for capturing the hidden layers of humanity. Quiet spaces that make you pause and courageous moments that make you weep. And each photograph, no matter the subject or emotive impact—monks meditating, African warriors in plank, lovers entwined in partner yoga—somehow emits a similar magic. Recently, I had the pleasure of interviewing Sturman and found myself just as impressed with his kindness and humility as I was by his artistic talent. 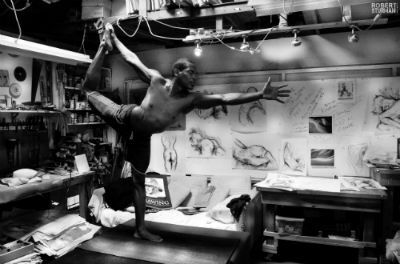 Join us in our conversation to hear his take on yoga and the artistic process, the role of the artist in our society, “effortless” creativity, and purposeful living. Why do you practice yoga and how does the philosophy influence your art? I practice yoga to remove the unnecessary. When I unroll my mat, it’s a special time to go deep inside and examine whatever keeps me from having a direct experience of life. And through stretching, breathing, opening, and sweating, I become much more relaxed, which enhances my work. When I walk out of a practice, I’m ripe and ready for clear expression. There’s a quote by Osho which says, “Creativity is a total relaxation.” I find this to be so true, and it keeps me coming back for more. The stillness that I experience in shavasana is such a valuable internal state. When I walk out of a practice, I’m ripe and ready for clear expression. What is it about the postures that you find intriguing? Simply put, asana is the most beautiful figurative poetry I have ever seen. I witness the whole history of humanity and art in these postures. [They evoke the] gestures of Greek gods [and images of] biblical stories unfolding. The drama of asana is an artist’s dream. What is the purpose behind the work you do, as far as what it has to offer humanity? How has your understanding of this evolved over time? My work emphasizes the beauty I find in this world. It also celebrates the world that we live in rather than fantasizing about a better one. I find that when we focus on goodness, the potential for more of the same is nourished. I know from my experience that when someone reflects back to me what I am doing beautifully, I am more inspired to fully step into that beauty. Even if it is just a small light at the time, that light will grow. I find that when we focus on goodness, the potential for more of the same is nourished. What is the role of the artist in our society? The artist has always told our stories. Take our museums, where history is so often depicted through the eyes of an artist. People are not only lining up to experience these stories through the artist's portrayal, they're also experiencing an emotional texture which can only be found through art. When I first realized this, I saw how necessary the artist truly is. Unfortunately, so many artists have lived lives of desperation and self-destruction. This is another reason why I gravitate toward practicing yoga, because I want to restore optimism and an uncompromising belief in life. Though you've traveled to many different countries, you've referenced India as the place where you “became an artist.” How did it have such an effect on you? I felt as if I was receiving something so profound, something I had not received at the art academy. It was then that I realized I could create from a place of joy and that my work could be a natural expression of the life I was living. This simple paragraph continues to inspire me on my path. What is the relationship between you and the subjects of your photography? There is such a wonderful, vulnerable relationship between those I work with and myself. Though my work does take skill to create, and a bit of technological expertise, I have found that the most sophisticated tool I use is my heart. There are unwritten contracts of the soul, and building trust with the model is an essential part of that. The model has to feel comfortable enough with me and trust that I am there with them in an effort to see their light. It’s powerful to show people how amazing they are, and this is what I try to do. Not only this, but also that they’re okay just the way that they are. As human beings, we often spend so much time feeling that we’re inadequate. So if my work can make people feel that they belong, then I am doing my job because everyone belongs. 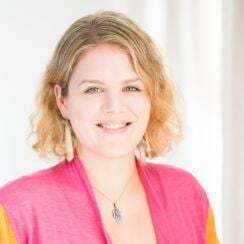 You've worked with a variety of people and organizations—yoga celebrities, cancer patients, the prison yoga project, the Africa yoga project, and more. What's your latest venture, and how do you decide where to invest your creative energy? More and more, I am drawn to creating bodies of work centered on what I would consider “game-changing” themes—or ideas that show possibility. I want to create images that expand how we think about things and bring a sense of connection to people of all walks of life. I call this the “I am a Yogi” campaign, and it’s based on the idea that we can create more light by turning the lights on. Building awareness is an important aspect of my work. 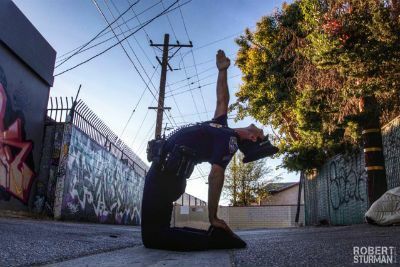 For example, I just completed a portfolio with a police officer in Los Angeles, dressed in uniform, doing yoga. I’ve made this a focus because there has been so much bad press about officers who have abused their power. While it is necessary to hold human beings accountable for unacceptable behavior, it is just as necessary to praise and celebrate those who are living lives of excellence. Sometimes people need to see what is possible in order to have permission to transform themselves and their perspectives. So what’s next for you? What do we have to look forward to? It's common for clothing companies to send me leggings to offer to the models I work with. One day, a company by the name of Bend Active approached me, asking if I’d like to license my images into my own line of leggings. I loved the idea, but I wanted to design them myself. So that's what I am doing. I am putting together different portfolios from around the globe and I’m creating wearable art. Many creative folks describe hitting a wall every now and then. How do you personally stay inspired? I stay inspired by remaining enchanted by life. The artist is sort of like a child engaged in discovery, and when a child makes these discoveries, he wants to tell everyone about it. That’s what my creative process is like; and as Osho said, it’s effortless. I stay inspired by remaining enchanted by life. Is there a special quality that a photograph often has when it catches your eye? I look for the place in between a tear and a smile. I want to tell our story, and when an image touches the heart with a quality of sadness, longing, joy, as well as the pursuit to become stronger as people, my attention is caught. That’s what I am searching for. I know many find their favorite artists on social media sites these days, such as Facebook and Pinterest. How has this affected the work you’re doing? I never was very much into computers when I was growing up; however, with the invention of the internet, it occurred to me that there was a new style of communication occurring that my generation could pioneer. I realized that as an artist, I could open my studio doors to the world and have a dialogue with people on every continent and in real time. What’s more, I am also finding that the photograph is the king of communication. It has such an influential reach and power to change the way we see reality—it even has the potential to create a new norm. It all begins with an idea, and a photograph is an idea. Every photograph you ever make is an idea carving away a revolution. Over the years, what have been some of the greatest challenges you've faced as an artist and how have you overcome them? One of the greatest challenges was erasing my personal history. I needed to find my own voice and trust it so that I could create from a place of knowingness and wonder. It takes time. It takes obsession. It takes falling in love with creation, and falling in love with my own work. “Falling in love with my own work” might sound narcissistic, but there is so much energy and inspiration within love itself that having reverence and adoration for my own heart, what it wants to say and do, is incredibly important. One of the greatest challenges was erasing my personal history. You’ve referenced that pointing toward light and goodness is your goal as an artist and that your work is a natural response to this. So, from your perspective, what does it mean to live beautifully? 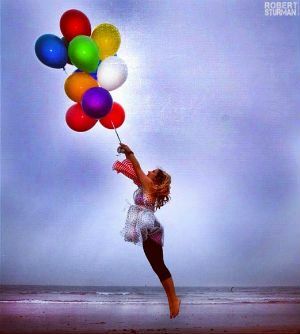 Living beautifully is living from the heart. Sincerity is everything. For me, it is about saying yes to myself—meaning doing things that nourish me, like going to yoga, meditating, quieting down enough to feel the wonder of existence, to have space to receive it, and then live from that place.